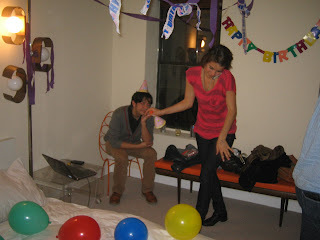 I've decided I'm totally into hosting parties at my apt, because I can stay home and still go to a party a day! 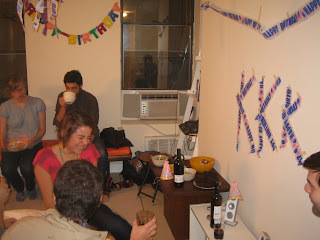 Last night we threw a sort of last-minute surprise mini-party for Lil' Kevs birthday at my place, but kevin, even with my stalling, got there before just about everyone else and I was forced to greet kevin with maybe the worst kind of surprise. SURPRISE-- NOBODY CARES ABOUT YOU!! Well soon enough my party co-chair cassie arrived with the brownies & the party hats and the lombardi's delivery guy arrived with our delicious pizzas, and the merriment was underway!! Balla snoring in my bed!